FILMINUTE is the international one-minute film festival that challenges filmmakers, writers, animators, artists,designers, and creative producers to develop and submit the world's best one-minute films. WHAT MAKES A GREAT ONE-MINUTE FILM? The best one-minute films resonate beyond one minute and affect audiences the same way any great film does. The challenge, of course, is to do it all in 60 seconds - no more, no less. FILMINUTE 2018 AWARDS ANNOUNCED! Congratulations to Best Filminute winner, Nuri Jeong, for her elegant and mysterious film, EDGE OF SEVENTEEN (South Korea). Congratulations, as well, to People’s Choice winner, Alejandro Itkin, for his timely and intense film, AIR TIME (Argentina). 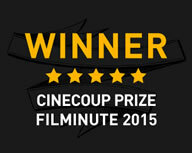 And to Mahdi Borjian, who has won the Top Rated Film award for the very moving SOUL MATE (Iran). This year’s 5 Jury Commended winners are: CAR PARK BLUES (Thailand), THE THIEF (Norway), SOUL MATE (Iran), PASSING THE FOG (Iran), and ONE (Russia). 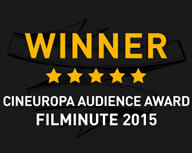 This year’s Cineuropa Audience Award goes to Antonio Panteras for his dark comedy, AL FINAL EXPLOTA UN GLOBO (Spain). The 2018 CineCoup Award for development will be announced November 20th. Congratulations to all the winners and please, film fans, continue to watch, rate, comment and share the 2018 films!